A Patient presented to our chiropodist office in Mississauga with a diagnosis of Anterior Compartmental Syndrome, which they received from sports medicine doctors previously. The anterior compartmental syndrome was experienced by this patient as severe burning pain in the shins of the legs on running activities. 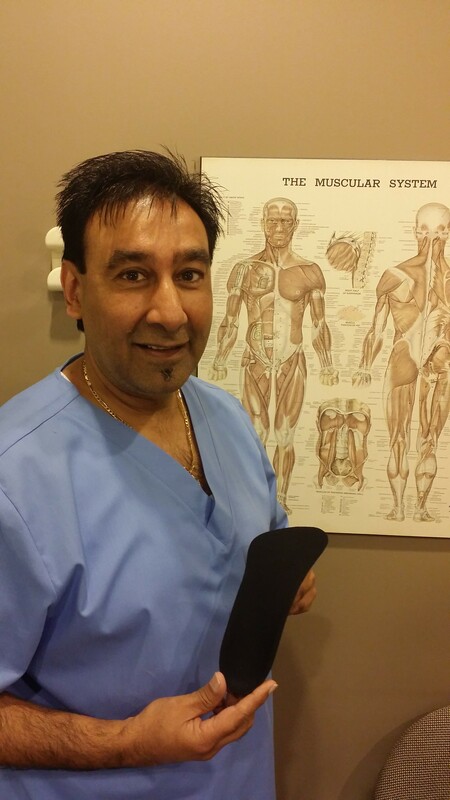 The patient was sent to our foot clinic in Mississauga for orthotics. Initially, the patient was given a brief biomechanical examination following a detailed history of the issues and any other medical conditions. The biomechanical examination is when the chiropodist observes how the patient moves through their walking gait, sitting, and standing postures. The chiropodist does observer the feet, but also the entire body from the bottom up. A detailed and a very simplified summary of the findings were reported to the patient with the aid of visual drawings and anatomy models. Questions were encouraged and addressed. The diagnosis was explained as soft tissue strain (tendonitis) of a specific muscle responsible for supporting foot collapse (pronation). The muscle in the leg and foot (Anterior Tibialis) was fatigued due to overuse, in trying to prevent the foot from collapsing, especially during running. In addition, the tired and overworked muscle required more food and oxygen at a faster rate than could be provided. The increased blood supply, attempted to offer this, thereby giving rise to a hot feeling in the area. Due to the vigorous nature of the activity of running, there was insufficient exchange of oxygen which precipitated anaerobic respiration with the bi-product being lactic acid giving rise to the burning pain. It is akin to having a ‘stitch’, which many runners can relate to. So collectively, the chiropodist was able to grow on the overall diagnosis for the patient from anterior compartmental syndrome to a combination of anterior shin splints and an inability of the diffusion of oxygen to meet the vigorous demands of the muscle in an environment of overuse. As the foundational education supported the symptoms, the treatment was much clearer for the patient to understands and appreciate. In this case, the patient required prescription orthotics to support the pronation of the foot, to allow the muscle in the front of the leg to function more efficiently, preventing overuse and strain.